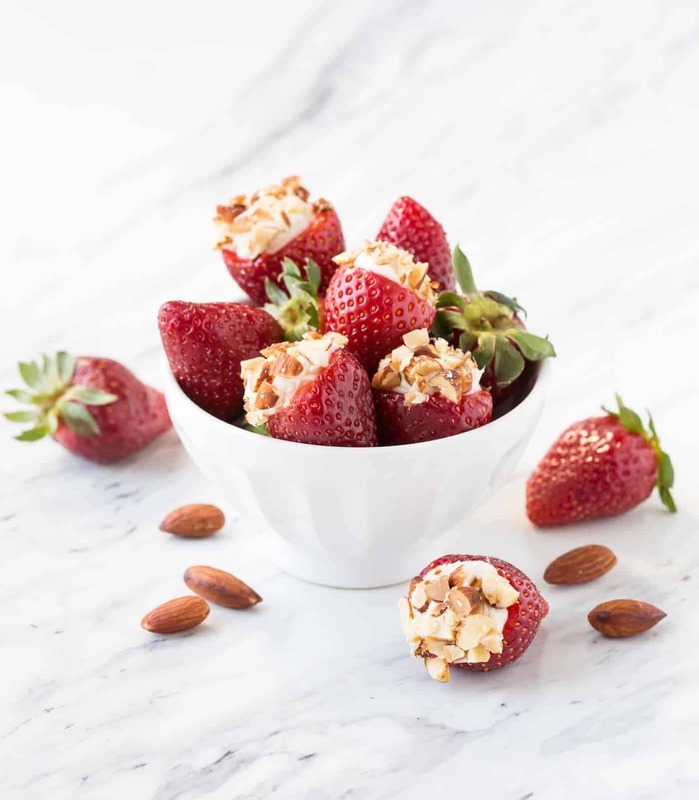 Dessert doesn’t get much simpler than these 5-ingredient Cheesecake Stuffed Strawberries! Strawberry season is fast approaching. 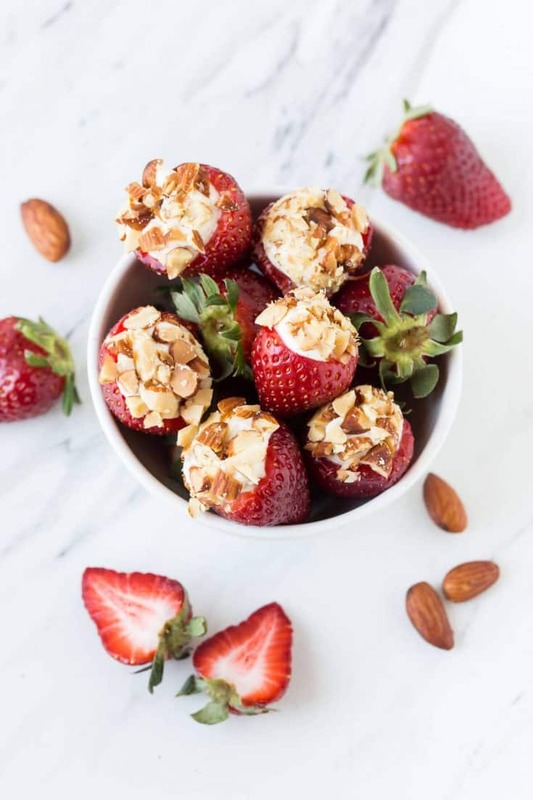 Although our versatile Balsamic Roasted Strawberries will always be one of my favorite strawberry recipes, these 5-ingredient Cheesecake Stuffed Strawberries are a close second! First come the flood of strawberries at the grocery store. After a long winter, those rosy little gems are a welcome sight! Then come the tiny baskets of early, sweet berries at the farmer’s market. Finally, if you’re lucky enough to live near a pick-your-own berry farm, there are the flats of fresh, juicy strawberries. It only takes one bite to remind us why wait all winter for these beauties. And it’s that same bite that helps us recall why these Cheesecake Stuffed Strawberries are so irresistible. Need a quick and easy dessert for a party? Pin these Cheesecake Stuffed Strawberries. They are simple, seasonal and perfect for when you want just a bite of something sweet to end your meal. I love the versatility of this recipe. Personally, I enjoyed the salty crunch that the almonds give the berries, but no worries if you’re not a fan of nuts. Try crushing up graham crackers, vanilla wafers, gingersnaps, Oreos or even Biscoff cookies to top the berries. Or skip topping them at all and just drizzle the whole plate of them with melted chocolate. I’m thinking there is no right or wrong here…only Cheesecake Stuffed Strawberry goodness. Tip: This trimming knife is my favorite kitchen tool for this recipe. The short, narrow blade gives enough control to cut a nice, deep cavity in the strawberry without taking out most of the fruit. Highly recommend! Place cream cheese, vanilla and powdered sugar in a small bowl and beat together until smooth. Place filling in a piping bag or a plastic sandwich bag with a corner cut off. Evenly pipe filling into strawberries. Sprinkle top of filling with chopped almonds. Refrigerate for up to 4 hours or serve immediately. Plan to serve the berries immediately if using a cookie or cracker topping so the crushed bits don’t get soggy sitting on the cheesecake filling. Holy schnikies! These look creamy dreamy delicious! I’ve had a crazy month too!. These look wonderful – just in time for strawberry season! Yes! Can’t wait to hit the fields for some farm fresh berries, Liz! Strawberries and cheesecake — what more could a girl ask for?! I’d love to pop a few of those into my mouth right about NOW. These looks amazing – I can’t wait to give them a try! I hope you enjoy them, Donalyn! How can you go wrong with a chocolate drizzle?? Thanks, Karen. You can’t go wrong with simple and tasty! these are great little bites to serve at a party! This is a great idea and I can’t belive I didn’t think about this. You have a very creative recipe. Love the colors and the combination. The pics look so scrumptious. Why, thank you! Sometimes simple is soooo tasty! I don’t think I would be able to stop munching on these!